The challenge is still going really well though- I've been postponing sharing updates here mostly because I am still waiting on a few bigger changes to be completed. I need to learn to just be open and honest about it all-not avoid relaying my experiences here. Just another lesson learned. 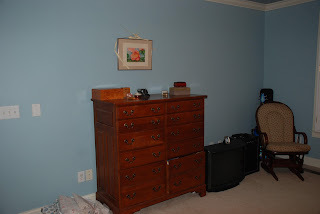 Due to an expansion of LIFE events last week, I had to postpone any further work on Week Four of my Slow Home Challenge: The Master Bedroom to this week. I'm excited to get to this work on this room in particular because I really want to create a space that is truly a haven at the end of the day. Right now, it's not awful to walk into, but I know it can reflect the slow home philosophies so much more. 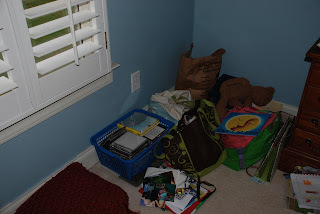 This week I'll be working to create a slower, more intentional space in my bedroom. The room provides plenty of space, pleasant architecture, and lots of natural lighting. Yet, as you can see...my inability to organize well, and to properly arrange furniture and other decor, has left this room feeling a bit void of life, not to mention being a place of comfort and tranquility at the end of a long day. 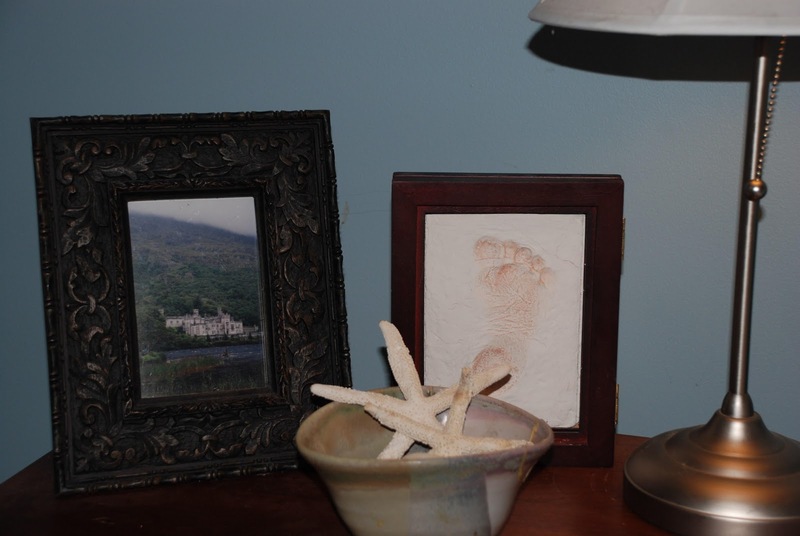 The few personal effects (a photo from a visit to Kylemore Abbey in Ireland; seashells from my honeymoon, and the sweet footprint of one of my babes). Some framed artwork created by Juliana. And this view...I know it may be a bit hard to see well, but I've always liked the transition and diversity in architecture from the bedroom ceiling through the doorway to the hallway and beyond. Here's to loads of achievement this week! 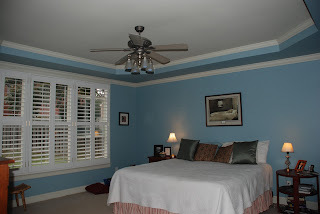 What elements of your bedroom will you be "slowing" down? Yeah, yeah, I know, only four weeks into my Slow Home Challenge, and I'm already slacking off...well, technically, I'm not really slacking off in terms of the actual challenge, just from taking the time to post about it here. This week has offered up some more of life's unpredictability, and my head is spinning as I'm faced with exploring alternative paths. I'm tired, and on days like this, I'm truly finding myself appreciating all that I hope to gain through a slower way of life. Hopefully the next few days will provide me with some fresh perspective, and some much needed inspiration! 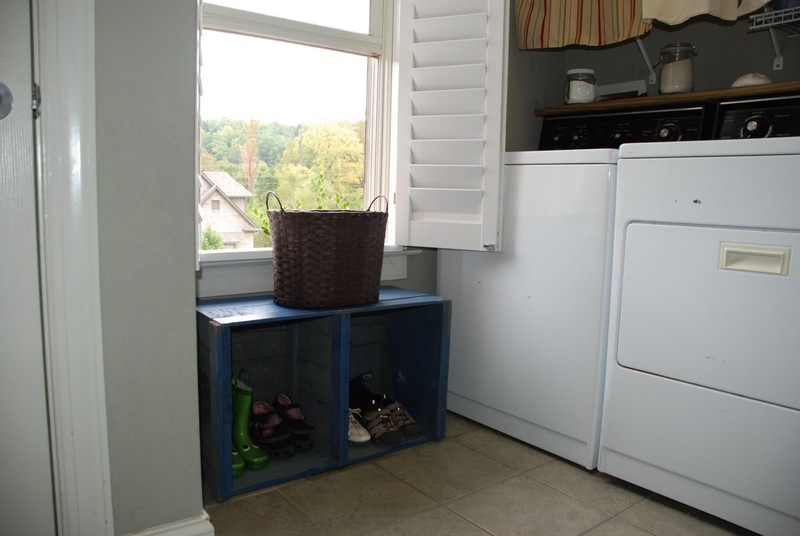 I used to loath my laundry room/pantry space...As the "catch all" room of the house, rarely was it ever organized or tidy. 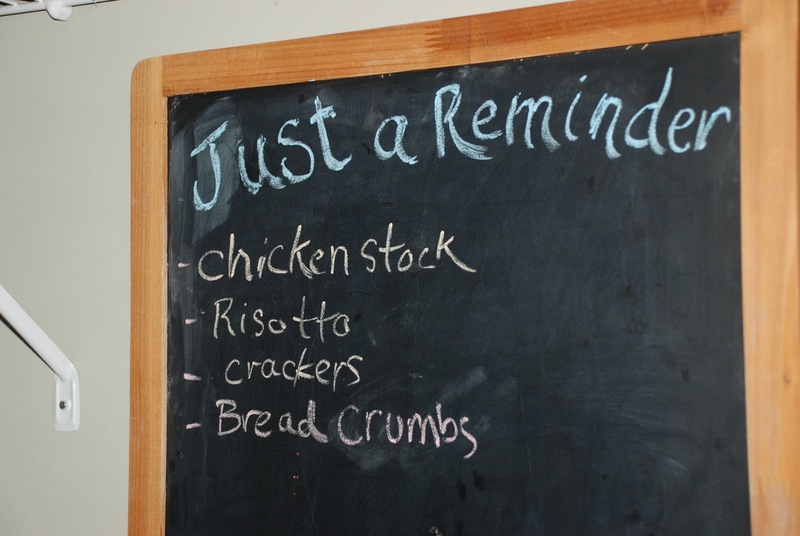 When we'd have company over, I used to make sure everything we'd need from the pantry was already out on the kitchen counters, just to prevent the chance of my guests seeing the unpleasantness of it all. But now...things are different! 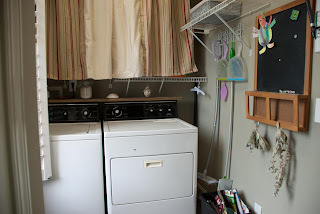 Week three of my slow home challenge had me tackle the laundry room and pantry, and I am super excited about the results! I told you it was going to be a tough one for me, and it definitely was. This particular space in my home really proved to be a true test to my dedication in this challenge (it took a lot more time than I would have liked to get it to where I was content). 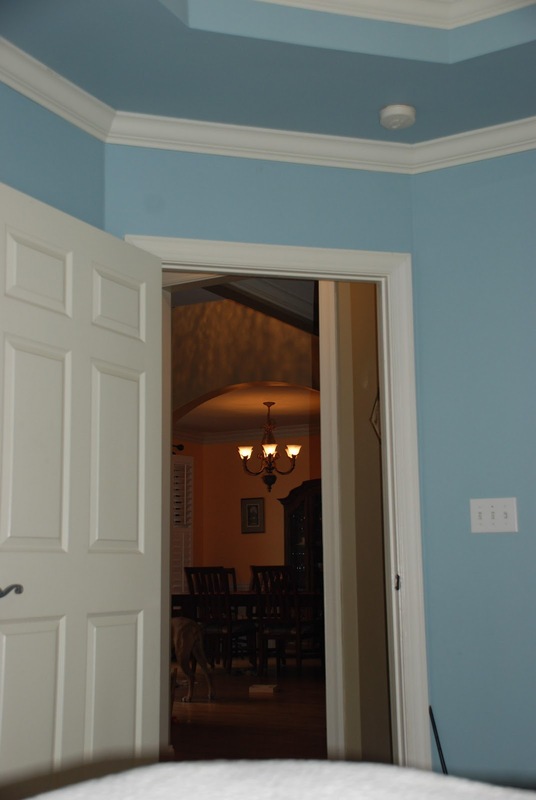 Yet, at the same time, it also gave me a great opportunity to dig deep, to really try and harness my inner creativity so that I could create a room that was efficient, designed well, and easy on the eyes as well. I used to thank God that there was a door I could keep closed...now I'm thinking of removing it altogether. 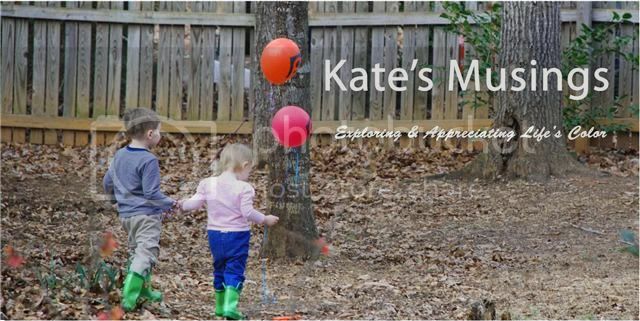 the kind of ohhhs and awes I'm hoping for when you see the next photo! A bit better, wouldn't you say?! Of course, I am slightly biased, but to me it is a gazillion times better. Ahhhh, I'm just going to sit and stare at it for a minute. Go on, scroll back up again to see the uglyness it USED to be. Not too shabby, eh? 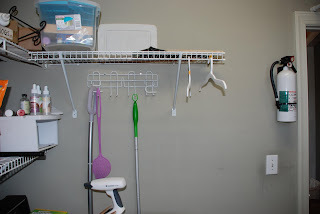 In addition to providing better organization, I also added some decor to the room to help give it a more personal feel, and to help it feel like another "room" in the house, not just an ugly utility room. 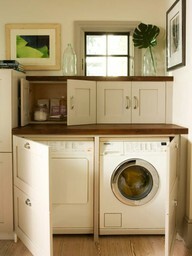 I found an old, weathered, long piece of wood in our garage that now fits nicely along the top of the washer and dryer. I placed some glass jars, shells, etc... upon it for display. 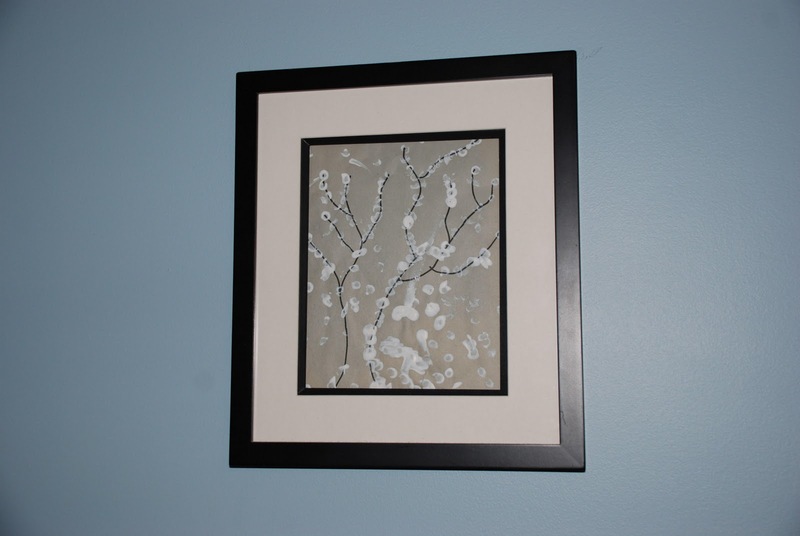 I also hung some nature inspired art I'd put together last year: simply framed, dried ferns. I ditched (not litteraly) the stacking blue (and pink for Jules, of course) buckets where we stored the kid's shoes, cleaning cloths, and vegetable bin, and traded it in for this old wooden crate. I stole it from my own kitchen. Yup, sure did, and I think it serves a much better purpose here. I can't even tell you how good it feels to walk into this room now, and have all of that wonderful floor space. Before, most of the time we'd find ourselves having to make a path way through all of the kitchen laundry on the floor, the large bag of dog food, and all of the other random "stuff." It was a nightmare to try and bring the laundry basket in here to start a load, I'd literally have NO place to set it down. Now, I feel that the floor space in this room is truly representative of the slow home principle that encourages "clear, unobstructed circulation" throughout the home's overall pathway. 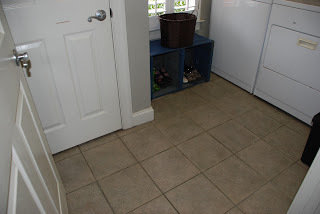 I shifted the washer and dryer a few inches to the left so that I could have more room for brooms and mops, etc...and also for the recycling bin that used to practically block half of the room's entry. 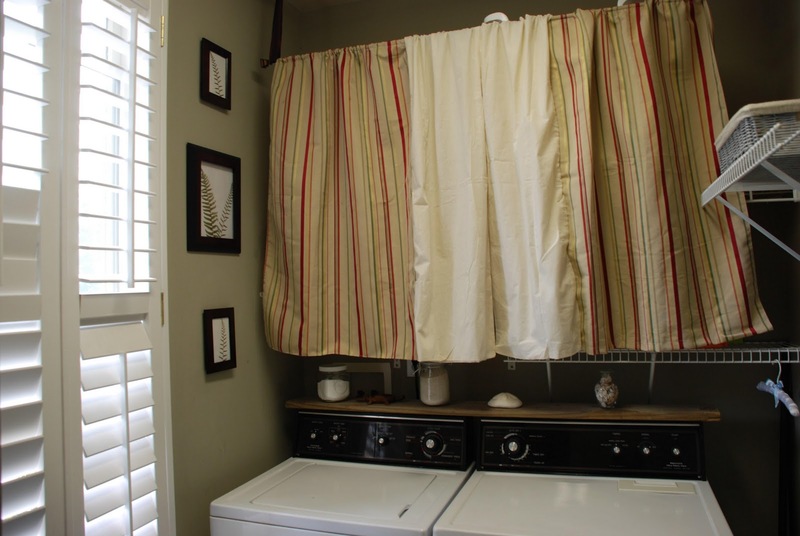 As much as I'd really like to have some fancy, shmancy cabinets above the washer and dryer, it's just not in our budget right now, so instead I improvised, and added these curtains-which I made from material I had on hand. I moved this chaulk board from a wall in the kitchen where it was hardley ever used, except as another place to display the kid's artwork. Now, it's become a fun place to jot down pantry items that need restocking. 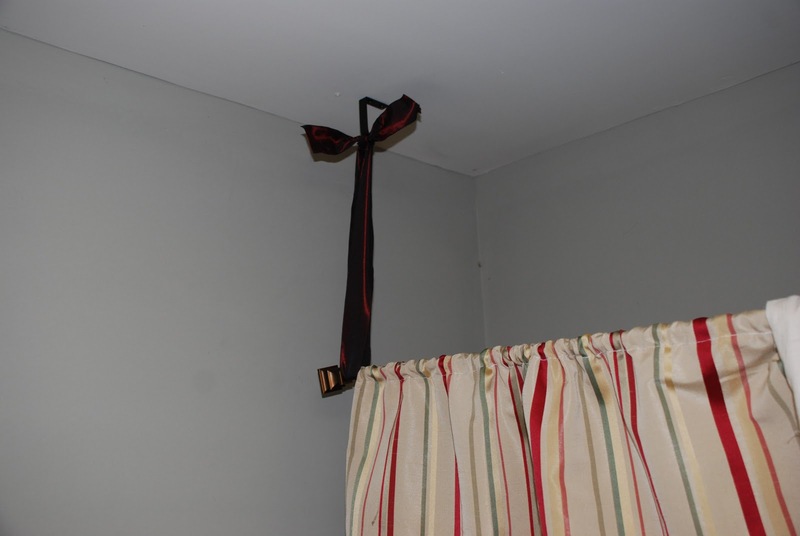 I installed brackets in the ceiling and hung the curtain rod from heavy ribbon. I think down the road I might swap the ribbon out for some type of lighting chain. It felt really good to "shop" in my own home, using what I already had available, rather than going out and buying more stuff. 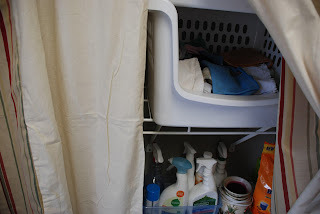 In order to better utilize all of that wall space above the washer and dryer, I stacked a few bins on the shelf and transferred all of my cleaning cloths here. It's also nice that I can hide all of those unsightly cleaning supplies behind the curtain. 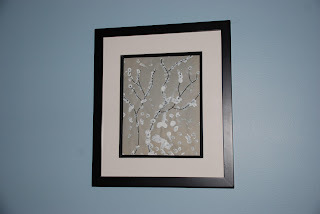 This is one of the two items I purchased for the remodeling of this room (Ross, $4.99). I really needed a place (besides the floor) where I could toss damp kitchen towels and cloth napkins from each meal. 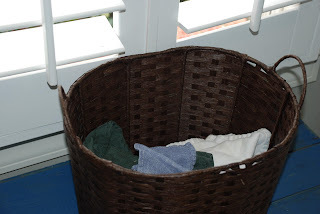 This basket is coated, so any moisture won't ruin the wood, and it's size is just right for its intended purpose. Before: The unsightly and unorganized mess. 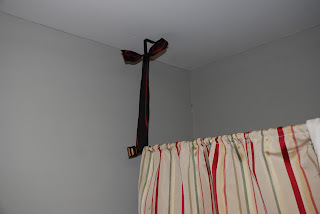 And remember that hanging mesh thing, that upon further consideration I discovered to serve little if any purpose? Now gone. 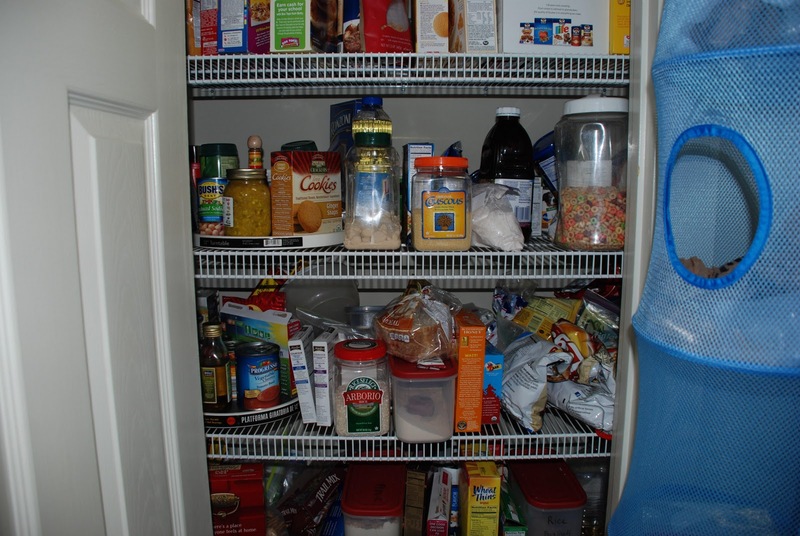 Cleaning out the pantry and re-organizing it, was quite the project, but I'm so glad I did it. Sadly, I discovered that my disorganization in here was causing us to be wasteful as well...Dry goods that were returned to the pantry in haste, were often not closed properly or stored well, and therefore ended up being disposed of before necessary. 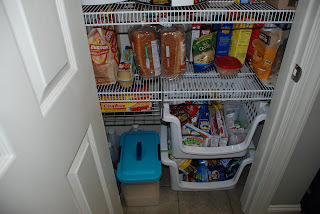 I also added two good sized storage bins to utilize all of that wasted space on the floor of the pantry. 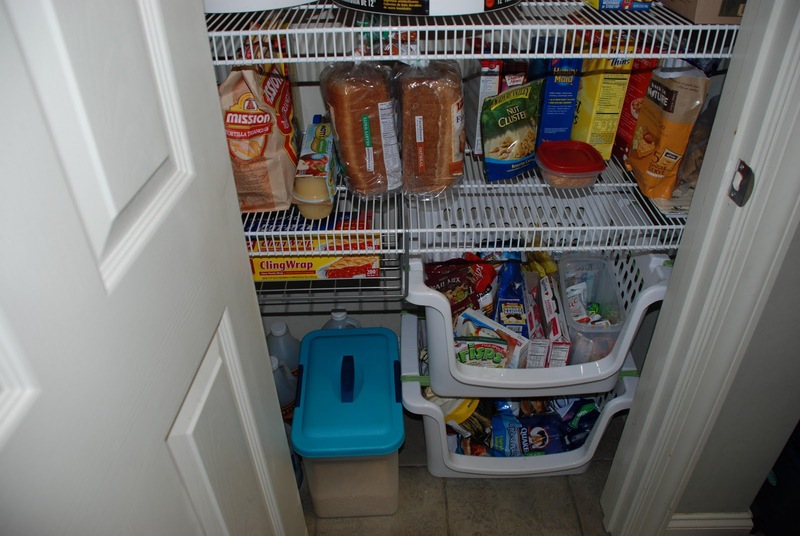 The top one is now a great place to keep the kid's snacks for school and so on. They love being able to go in a choose whatever they'd like, and I like that they are now better able to help pack their own lunches. 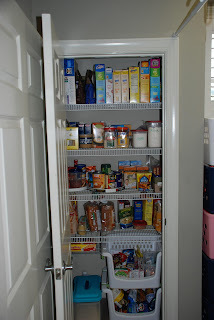 The other item I purchased is that small wire rack that is seen hanging from the lower left pantry shelf. Now we can easily access foil and such, without having to search endlessly for it through a sea of cracker boxes. So there you have it. 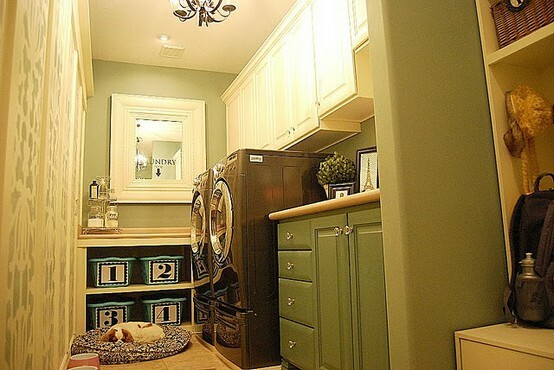 I have to say that so far, tackeling the laundry room in my slow home challenge has given me the greatest satisfaction. I feel great about the changes I made, and truly feel that now, the overall room is a much better reflection of a slow home space. It's efficient, walkable, and although it serves several purposes, it now does so in a truly beneficial way. Simply put, I love it. 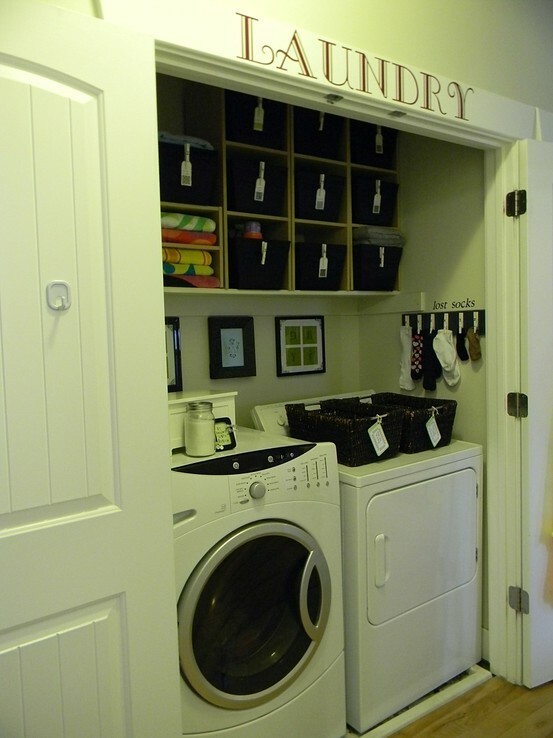 If you're following along and partaking in this challenge on your own, how did your laundry room/pantry do-over turn out? I'd love to hear about it! The laundry room/pantry challenge this week is moving right along. It's been a busy week for me work-wise and I've had a few other personal obligations to which I needed to attend, so I'm feeling a little bit behind in achieving my original goals for the week. Yet after speaking by phone with John Brown yesterday, founder of the Slow Home movement (I know, I was pretty excited about it too!!!) regarding an article I'm working on, I was happy to learn that the slow home concept is something that should be considered more of a process, that it's not necessarily a home project that you can just whip out in a few weeks. So for now, I'm happily applying the small changes I am capable of making at this time, and am making notes here and there about additional (and maybe even larger) changes I'd like to pursue in the future. After all, the idea of a slow home should be aligned with the notion of supporting a slower lifestyle...not putting more pressure upon ourselves to get the job done as soon as possible! Oh, and if the above mentioned conversation with Architect John Brown peeked your interest, you'll be happy to know that I'll be sharing more about it with you soon! Lovely, isn't it? 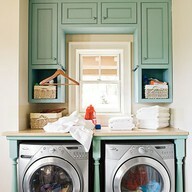 Sorry to disappoint, but no, this is not my laundry room. I am one of those people who loves the idea of decorating, more than the actual art of making it happen. 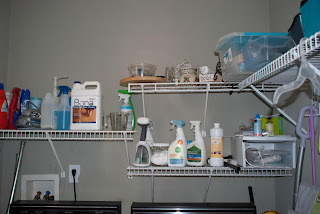 For those of us who are a bit challenged in this particular arena of life, creating organized, functional, and decent looking spaces (it doesn't even have to be beautiful...although that would be great) throughout our homes can often be a frustrating endeavor. That might explain why so many of us don't ever get around to making it happen. 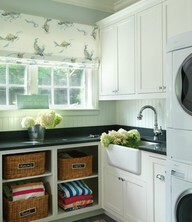 properly accommodate a great laundry room. This is a fantastic example of that! be both functional and well designed. 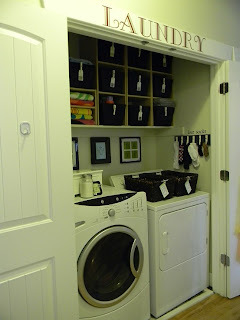 This week I'll be dedicating time to tackle and slow down my home's laundry room/pantry. 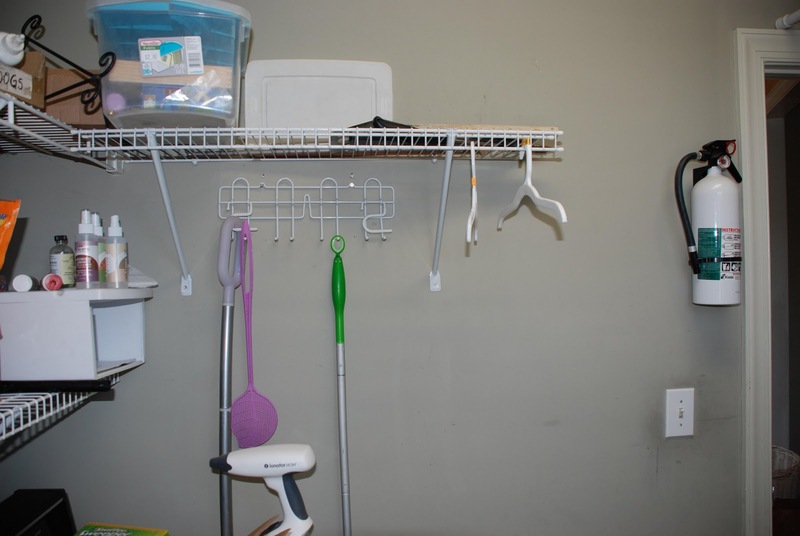 This is a tough room for me because it serves waaaayyyy too many purposes, and is constantly disorganized, and therefore a true hindrance of me gaining better efficiency. located, highly funcational, and do not conflict with other uses." 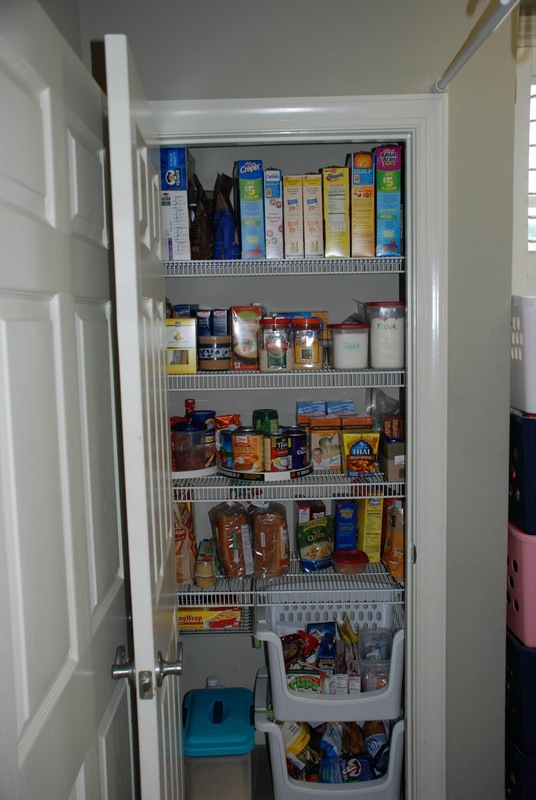 our pantry: not a whole lot to brag about there! 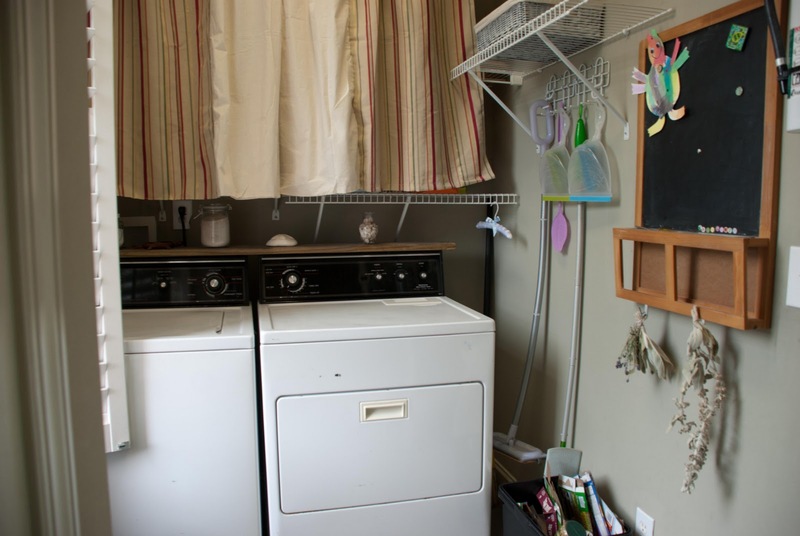 I am thankful that my home actually has a laundry room (with a door I can close, might I happily add), and a pantry separate from the kitchen, yet, I'm not so sure that they're being practically right on top of one another truly reflects the Utility philosophy of the Slow Home. 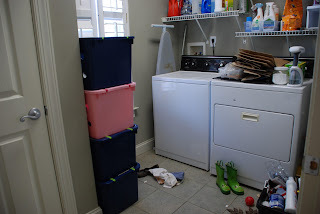 It is what it is, however, and unless my husband agrees to build a whole new laundry room in the attic (which I think is a fantastic, yet doubtful idea) we are going to have to accept this space as a multi-functioning room. I think that actually might be it...unless of course I mention all of the random junk that usually ends up sitting on top of the washer and dryer during the week because I can't seem to find a better place to put it. Yup, then there is that stuff too. We do have lovely tile floors, high ceilings, and a decent size window that lets in lots of natural light. cabinets in which I could properly store (hide) all of this stuff! So there we have it. Way too many things being stored in such a small room. 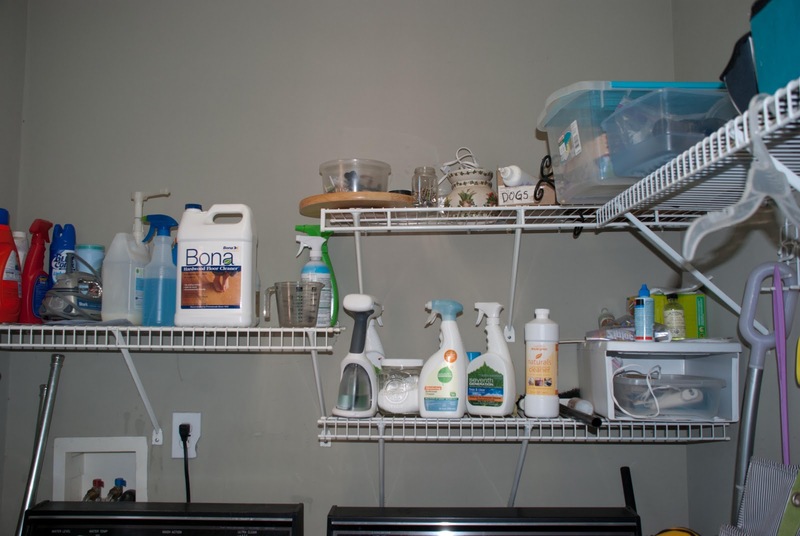 Although this is going to be a tough challenge, I'm excited about going through this room in an effort to reduce and organize the contents, make it more asthetically appealing, and improve its overall efficiency and functionality. Another challenge for me is that I am sure this room is going to require a lot more of my time. These days I work part time as a freelance writer, and am feeling the time squeeze now more than ever. With that in mind, I plan on having the kiddos help me out with this week's challenge. (I'll be sure to update you on how that aspect of it goes as well!). 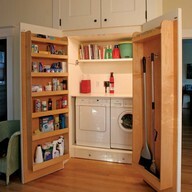 Does your home's laundry room/pantry align with the slow home philosophy? If not, what changes will you be making this week?